Hi guys! You ladies have been asking me for some off duty looks so I super excited to bring you just that in this post! First of all let me say that I have been loving the update that Athletic Wear has taken, no longer is activewear just for the gym it now fits right into streetstyle! I honestly never would have thought of wearing my workout clothes outside of the gym in the past but now with mesh and army details it’s as chic as my streetwear. I especially have a weakness for sneakers right now. 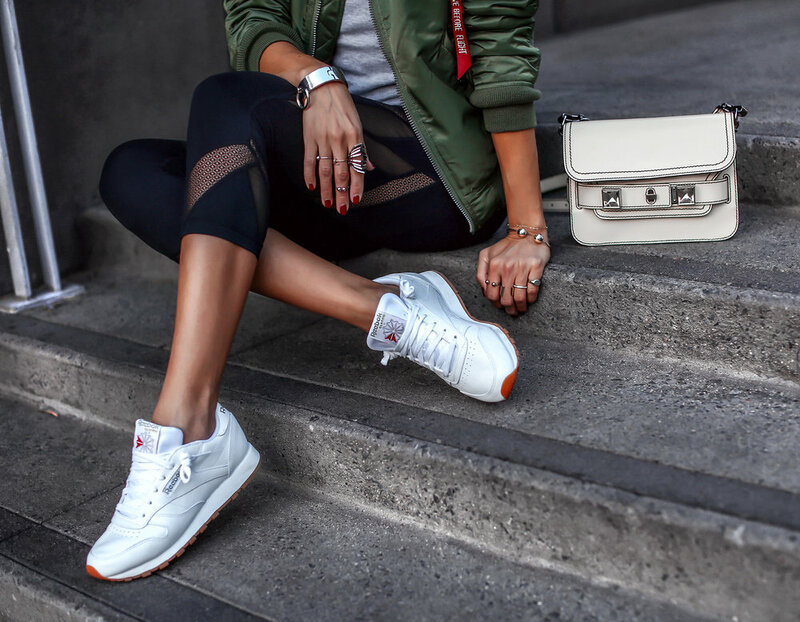 I am so in love with these Reebok Classic sneakers that I scored on eBay! Last weekend I was in San Francisco and I’m so glad I packed these. We walked and walked all over the city but I didn’t feel like I sacrificed my personal style to be comfortable. If you saw my Instastories you saw I wore them with everything; leather pants, denim and my cozy sweaters. These babies fit perfectly into my Fall Off Duty wardrobe! I love that they have a bit of a vintage vibe to them, making them more of a statement sneaker then a normal tennis shoe. I’m already thinking of styling these with a midi skirt and cozy sweater, such a fall trend to jump on. 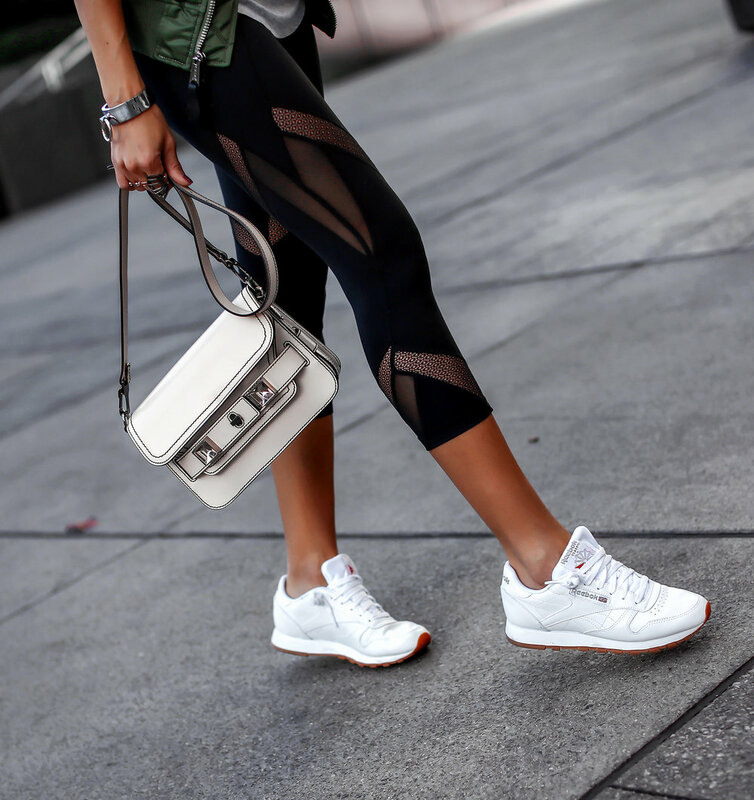 And of course leave it to my new favorite retailer eBay; to have every fashion need covered with an awesome selection of statement making sneakers! I found these and so many other fun pairs for you and as always at a fraction of the price! Are you as addicted to eBay as I am by now? So my newest insider tip since discovering eBay is the mobile app! You guys, I now use it as a tool when I’m shopping for anything!! If I’m out and about shopping and find something I love, I will quickly jump on the app and see if I can find the same or similar item there AND guess what, I 90% of the time have been able to find the items I’m looking for and of course for a great deal! WIN! I also have some additional eBay shopping tips listed here and here if you need them ladies. Happy shopping ladies! Thank you eBay for partnering on this post.